So I put all new ball joints on the 68 Baja. I also pulled the pan and replaced it then went through and replaced various parts that needed it. 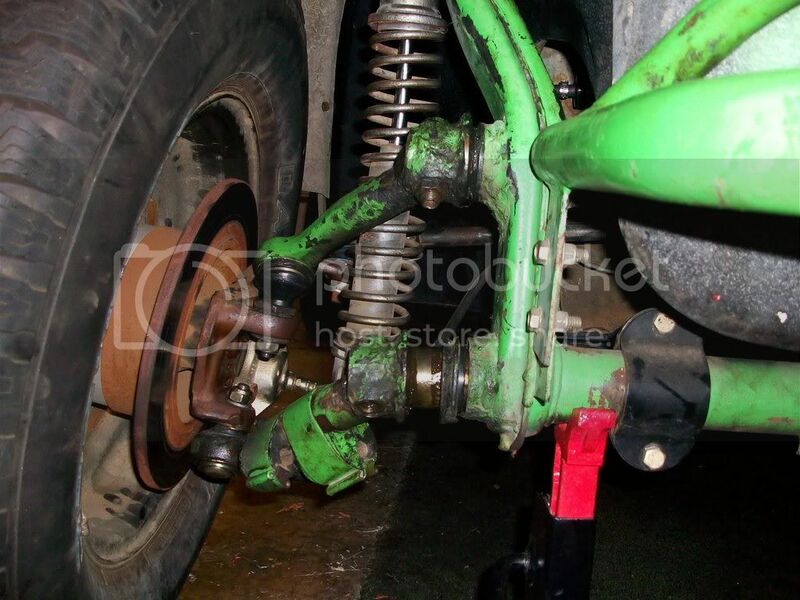 I had a friend help me that had worked on bugs before (my first time), but when we put the control arms on it didn't look quite right because the coil over was touching up against the top control arm. I couldn't remember if it was like that before so after I reinstalled the engine and backed out of my drive way there was a "pop"! 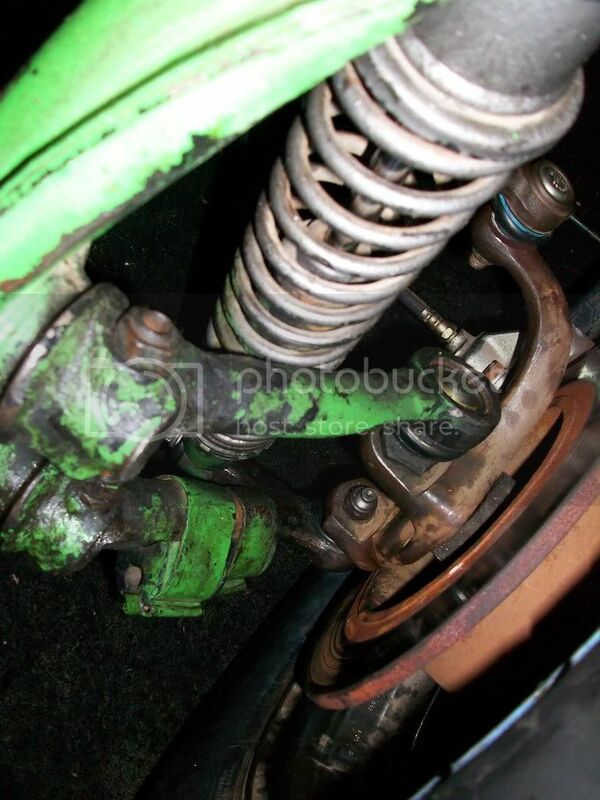 It seems the front left lower control arm had popped out of the torsion bar! I'm not sure if it just wasn't tightened down properly or if something was installed wrong. Here are some pics. All help is appreciated!!! The last two pics are of the drivers side. Things to know VW front ends are like shopping cart wheels. Work great when going forward when backing up it trys to turn around. you might of had too much toe in and this helped pull your arm off. Make sure you can see the spring pack in the end of your arm. the hole that looks like a stop sign or hexigon. the stacks should be all the way to the end or close to it. If in your case the stack is still in place on both lower arms you have broken springs. That would be the coil over fix. 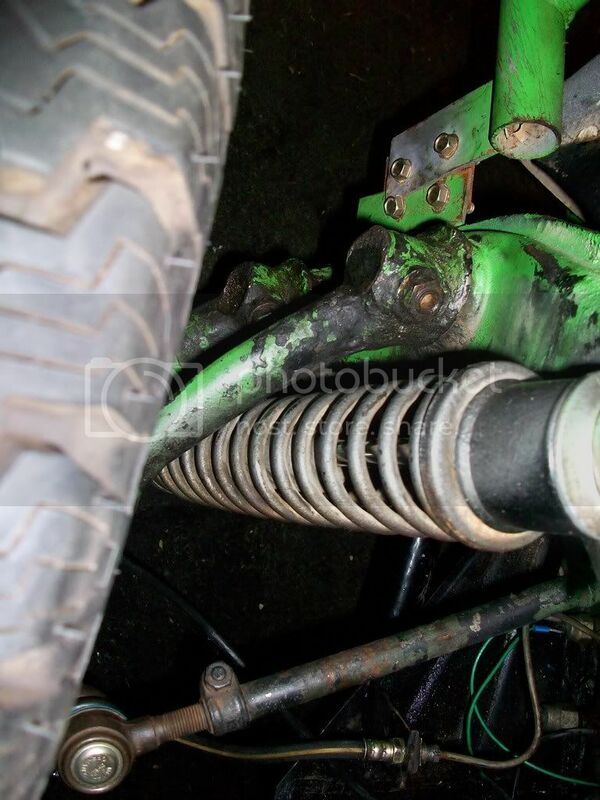 (Still Bad) But from what I can see your missing the grub screw/keeper bolt/hex bolt/god nut etc. from your lower arm. grease hole with no inner allen bolt and outer lock nut. Also check the ones in the midle of your beam too. Each bolt has a point the fits into a cone drilled into the springs. yep, i that first pic the top grub screw looks like its not tightened/seated all the way either, theres a lot of the set screw sticking out past the lock nut. So what was the final outcome of this? A quick note: If that BJ front end is lifted, Here's a thought, while we're looking at pictures. 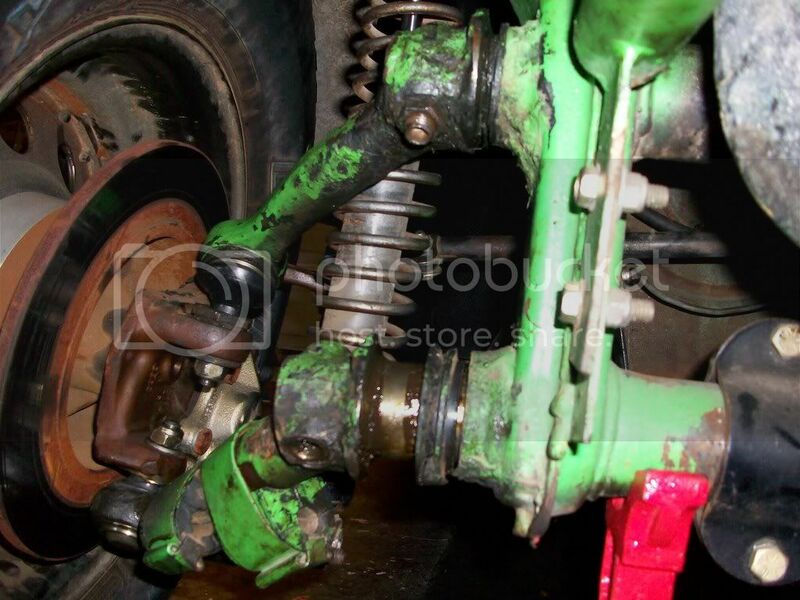 See the adjuster that goes between the spindle and the upper ball joint. There is a notch in one of the flat spots on the six-sided nut. From memory, I've had the best luck (closest alignment) running that notch pointing forward. Loosen the ball joint lock nut and rotate it. I'm sure I'll get a bit of technical posts as to how to do is properly as a result of this post (annd I welcome them... it's good discussion). I did go through all of the technical end of it when I set mine up years ago. When all the dust settled though, I found my notch pointing forward. I could be totally off but this is something to look into if you want it to drive as nicely as possible with the least amount of tire wear. There is a fork tool at almost all the local auto stores that can remove ball joints. It'll probably be the small ball joint remover there (Kragen, Napa, Autozone). I got mine at Kragen. To put balljoints in it's best to use a press, so I went to NAPA and they charged $10 or $15 a piece to press them in, which was by far the cheapest. I called all around and got quoted up to $140.00 to press 4 balljoints in!